Sunday's surreal outbreak of tornadoes, some as strong as EF-4, may have been the most violent seen so far north, coming so late in the season. 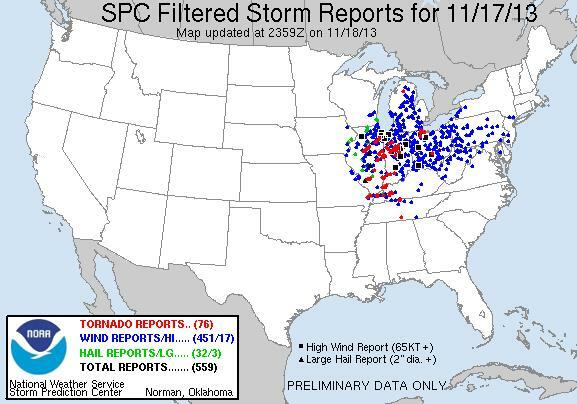 Tornadoes aren't exactly top-of-mind in Illinois in November. Two thoughts: you can retrofit any ground-floor closet into a "safe room" for a few thousand dollars. 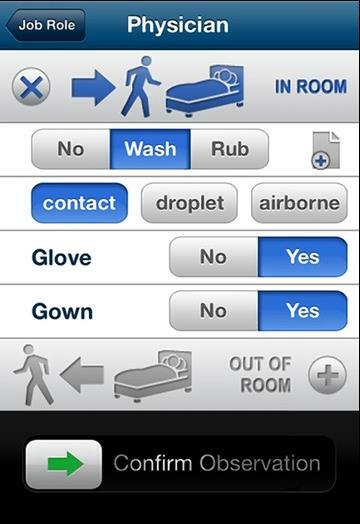 If you don't have a basement this is a good option, for the price of a family vacation to Disneyworld. 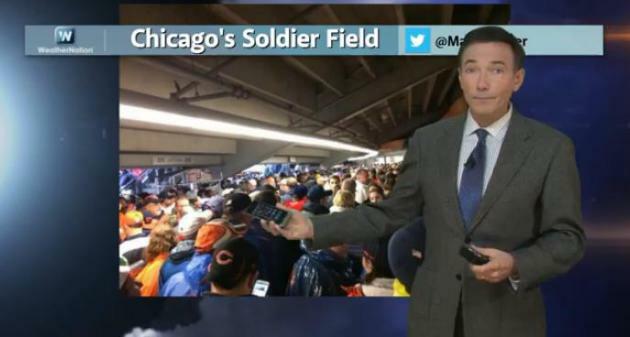 The slow, uncertain evacuation of Soldier Field during Sunday's Bears game was a reminder that you can't depend on anyone else for your family's safety. 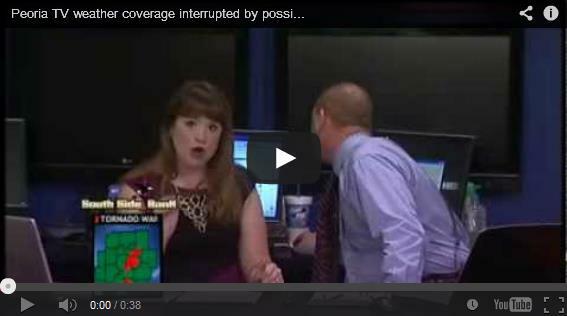 It all comes down to personal responsibility & being "weather-aware". My best advice: load up a few radar and warning apps on your phone and be proactive. Head inside LONG before you get the official order. Stay ahead of the severe weather curve. The pattern favors a series of glancing blows of arctic air for Minnesota, with the biggest storms spinning up over the southern and eastern USA. After peaking near 50F today temperatures cool off later this week. A period of light snow may brush the state late Friday; by Saturday it'll feel like January. Thanksgiving weather? Highs in the 30s; no mega-storms brewing into late next week. Winter mayhem may well be postponed until December. 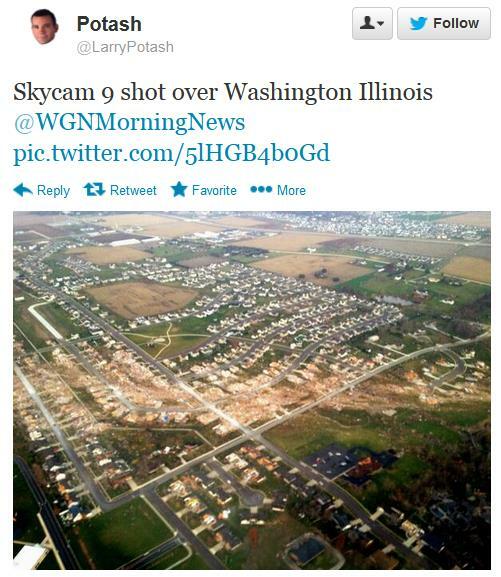 Photo credit above: "Aerial pictures of the tornado damage at Washington, Illinois, near Peoria is seen on Monday, Nov. 18, 2013." (Zbigniew Bzdak/Chicago Tribune/MCT). Total Devastation. 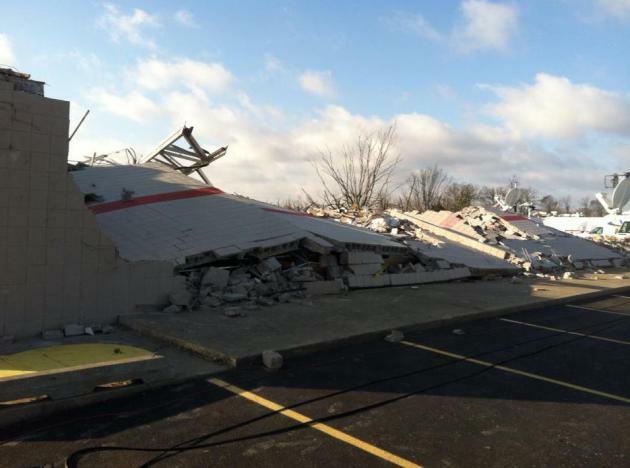 Ben Fiedler sent in this photo of what's left of an auto parts store in Washington, Illinois, one of the towns hardest hit by Sunday's historic tornado outbreak. Filtered Tornado Count: 76. The raw number was 91 as of late Monday night. But after NOAA analyzed each tornado sighting it determined that some of these reports were the same tornado, seen from different vantagepoints. It may be the 3rd or 4th biggest November outbreak in U.S. history - possibly the most severe so far north, so late in the season. Map above: NOAA SPC. Sunday's Historic Tornado Outbreak - Ways To Lower Overall Risk. Sunday's swarm of tornadoes was well predicted. There were no big surprises here - even though there was no way to know, in advance, which towns would be hit the hardest. For me it reinforced a few ideas: don't trust officials to protect you or your family - take steps to make sure you're in the weather loop wherever you go, 24/7, including Doppler radar and GPS-centric warnings. That, and if you don't have a basement consider a safe room. For the price of a family vacation you can reinforce a closet and lower the risk of becoming a tornado statistic. More details in today's edition of Climate Matters. SPC Nailed Sunday's Tornado Outbreak. 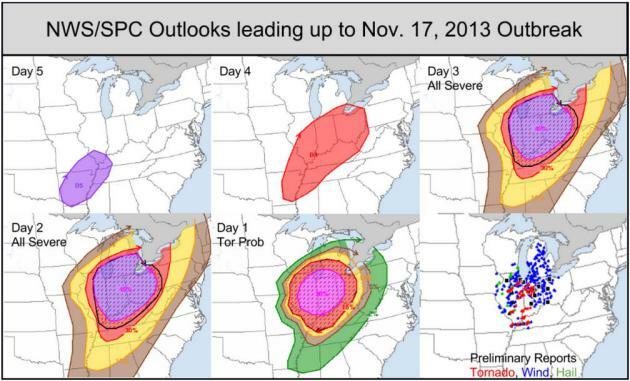 As early as 4 days before the event SPC was highlighting the Ohio Valley and talking about a major outbreak. On Saturday the risk was elevated to "moderate", then "high" early Sunday morning, meaning it was going to be a very active and violent day. You can see where the tornadoes actually touched down (red dots). That's about as good a severe weather forecast as you'll ever see. 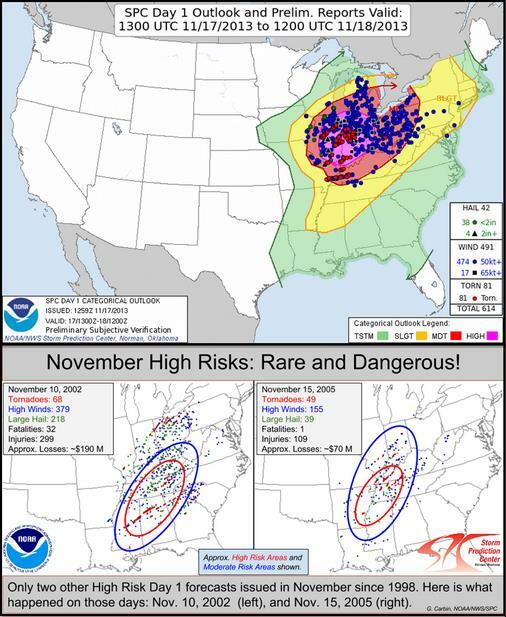 Third November SPC "High Risk" Since 1998. This may have been the most violent tornado outbreak ever recorded so far north (central Illinois into central Indiana). Source: NOAA SPC. Why Every Home Should Have A Basement (Or Safe Room). In light of more tornado-related tragedy I wanted to post a video from FEMA highlighting the merits of a safe room, which can be installed in nearly any home or apartment, costing a few thousand dollars to reinforce a closet: "In May 2008, Tom Cook and his teenage daughter Ryanne survived a catastrophic tornado in Racine, MO, that leveled their home. But Tom's wife of 19 years and Ryanne's mother did not survive. Following this tragic event, Tom vowed to be prepared for disasters in the future. 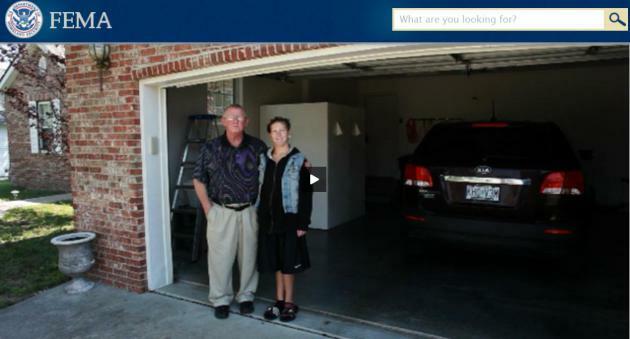 Tom and Ryanne moved to nearby Joplin, Missouri, to rebuild--this time with a safe room in their garage. 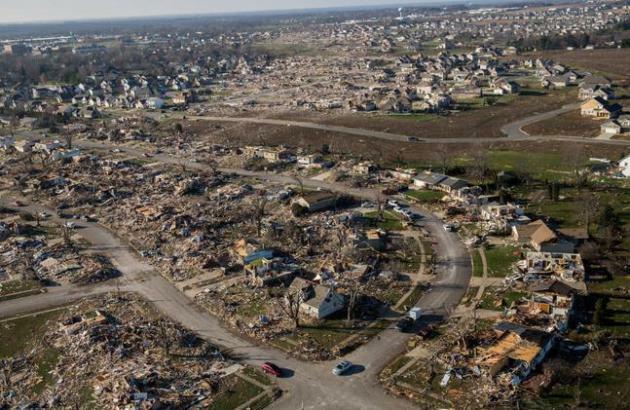 This decision proved fortuitous when an EF-5 tornado touched down just three years later on May 22, 2011. 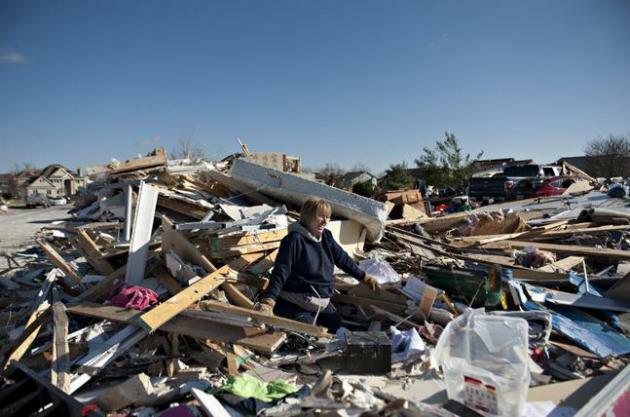 The storm leveled their home; however, Tom and Ryanne were safe and unharmed. "It was blown away completely - again," Tom said. "The only thing standing was that storm room." - Location: Joplin, MO. Indianapolis TV Station Trolled With Doctored Photo Of Tornado, A UFO, and Bigfoot. 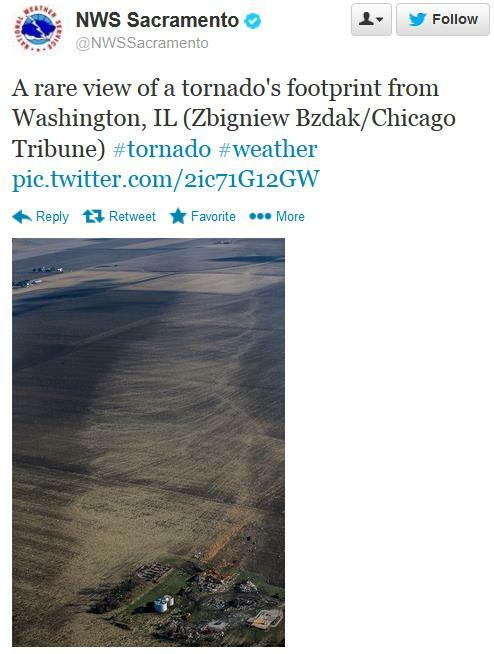 The joys and perils of the Internet/Photoshop Age; here's a cautionary tale from TVSpy: "WTHR appears to have been trolled during its coverage of the storms that rumbled across the state when an image of a fake tornado that included a UFO and bigfoot was uploaded to its viewer photo iwitness site. Jim Romenesko reported that Indianapolis Star reporter Eric Weddle found the mistake and tweeted about it..."
Pacific Air Next 36 Hours - Canadian Breeze Returns By Late Week. ECMWF guidance shows highs within a few degrees of 50F today and Wednesday, then a gradual temperature tumble by late week. Highs may not climb out of the mid 20s Saturday, moderating again next week. A storm spinning up along the leading edge of this glancing blow of arctic air may squeeze out a little light snow late Friday. Graph: Weatherspark. Cold Air Building. Although not the "Mother Lode", not yet - cold air is forecast to push south of the border the latter half of this week. The dark red line marks the predicted 32F isotherm, the green line shows temperatures below 0F. 84 hour NAM model data courtesy of NOAA and Ham Weather. 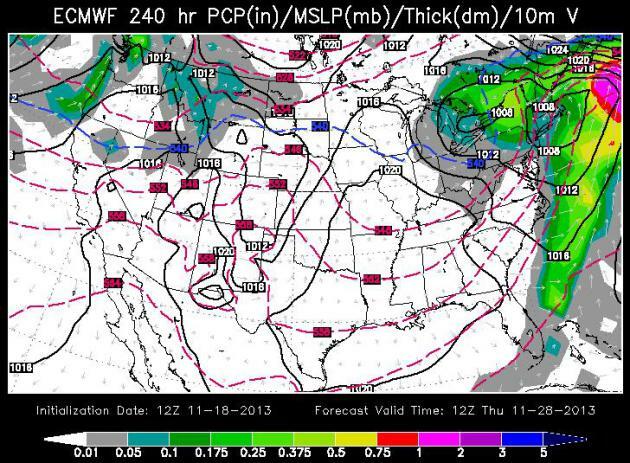 Serious Late Week Lake Effect. 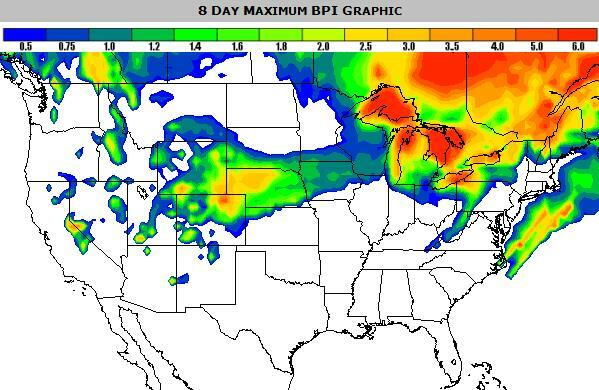 Our modeling guru has created a new product called the BPI, or Blizzard Potential Index, which calculates the probability of low visibility and heavy snow. Although not a true blizzard, lake effect snows may produce local white-out conditions near the Great Lakes later this week into the weekend, another region of snow from north of Denver into Nebraska. Map: Ham Weather. Negative Phase Of AO and NAO By Early December? A negative phase usually correlates with a jet stream configuration that favors much colder conditions east of the Rockies. I wouldn't be at all surprised to see a numbing start to December, especially Upper Midwest and Great Lakes to New England. Graphs: NOAA. Implications Of A Negative Arctic Oscillation. The GFS seems to confirm a turn to much colder weather after December 2 or so, maybe a few days of single-digit highs and subzero nights the first week of December? We'll see. 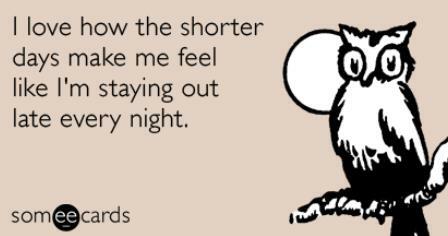 Pre-Thanksgiving Travel Headaches? Although I don't see any major snowstorms next week, ECMWF guidance shows a significant coastal storm next week for the eastern USA, a cold, windswept rain possible. This may cause some travel delays, by land and air. European solution valid midday Wednesday, via WSI. Early Look At Thanksgiving Weather Map. Rain is forecast to taper over New England on Thanksgiving, some sun due to downslope (sinking air in the lee of the Appalachians) from D.C. to Charlotte. Dry weather is predicted for much of the southern and central USA on Thanksgiving Day, snow for the northern Rockies and a cold rain from Seattle to Portland. 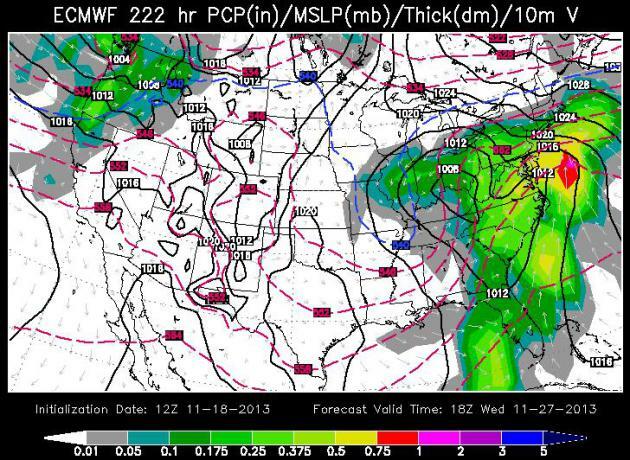 Map above valid 12z Thanksgiving morning, courtesy of WSI. 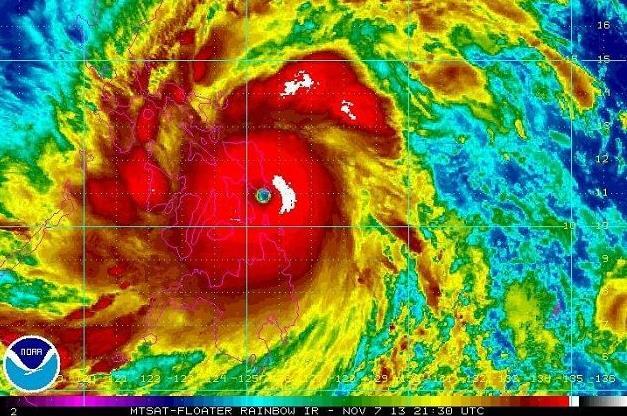 Incredible Footage Of Super Typhoon Haiyan's Storm Surge. I've never (ever) seen the water come up this rapidly - I can now see how many observers compared Haiyan's storm surge with a tsunami. The YouTube footage is here. October Weather Highlights. 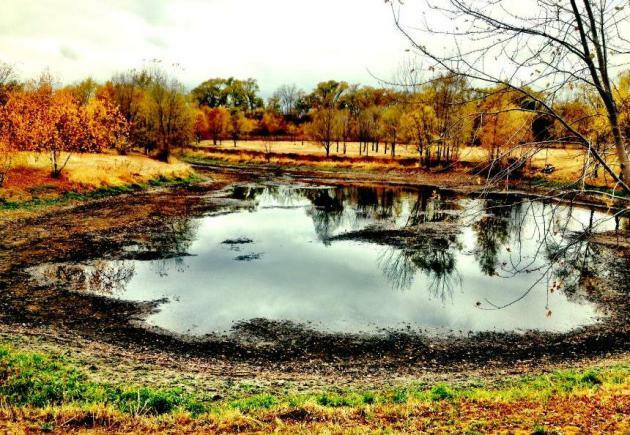 From record blizzards in the Dakotas to historic flooding in the Austin, Texas area, to an EF-4 tornado near Wayne, Nebraska - October had something for everyone. Map: NOAA NCDC. Starbucks Puts A Coffee Shop On Rails. Just when you thought they couldn't jam in another Starbucks on your block - let's put them on rails! 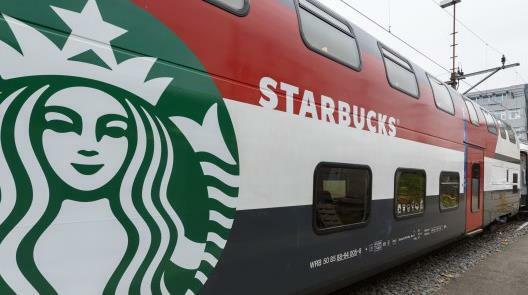 Here's a clip from Gizmag: "Apparently not content with putting a coffee shop on every second street corner, Starbucks has teamed with Swiss Federal Railways (SBB) to expand into rail travel with the unveiling of the first railway carriage converted into a Starbucks. The double-decker car uses a design that combines design elements based on coffee with Swiss detailing in what Starbucks calls the smallest bar it has ever designed..."
Health-Care Apps That Doctors Use. I found this Wall Street Journal article interesting; here's an excerpt: "...Mobile apps for smartphones and tablets are changing the way doctors and patients approach health care. Many are designed for the doctors themselves, ranging from handy databases about drugs and diseases to sophisticated monitors that read a person's blood pressure, glucose levels or asthma symptoms. Others are for the patients - at their doctor's recommendation - to gather diagnostic data, for example, or simply to help coordinate care, giving patients an easy way to keep track of their conditions and treatments..." (screen shot above: iScrub and Wall Street Journal). A Batmobile In Your Future? It would be fun to cruise down I-35 in one of these (might make it easier to merge too). 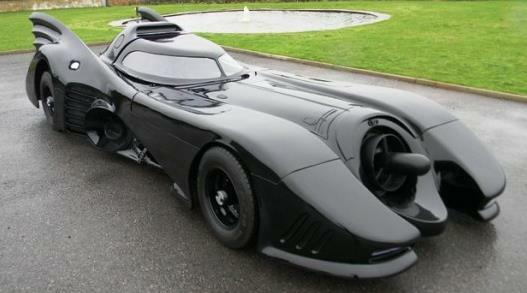 Details via gizmag.com: "Historics auction house in Surrey, UK, is listing a fully road-legal Batmobile for sale. It’s not an original – the car is a replica of the vehicle used by Michael Keaton in Tim Burton’s 1989 and 1992 movies – but Historics lists the piece as an "extremely well conceived tribute." "BLACK, low mileage, excellent condition, bespoke chassis, automatic transmission, fuel injected Jaguar 3.2 liter engine, remote ignition, hydraulic suspension, smoke release mechanism, flame thrower. US$145,000." 36 F. high in the Twin Cities Monday. 40 F. average high on November 18. 56 F. high on November 18, 2012. 7.6" snow fell on the Twin Cities November 18, 1957. 1981: Heavy snow with near blizzard conditions resulted in over a foot of wet snow, which caused the inflated fabric of the Metrodome to collapse and rip. 1957: Snowstorm in Southeast Minnesota. A foot is dumped at Winona. Heavy crop losses. * November 18 Minnesota weather history courtesy of the MPX office of the National Weather Service. "You don't need to talk about climate change per se ... Statistically, you are looking at a series of numbers. 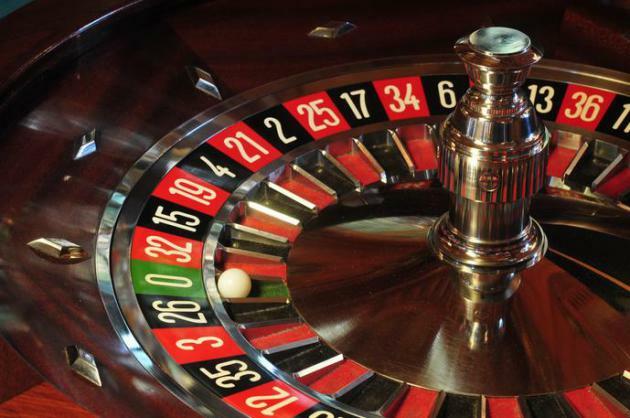 If it were a roulette wheel, you could say, 'It's coming up black more and more frequently.' Can I attribute that to black being overweighted by the croupier? Or to the pit boss, or the machine being broken? It doesn't matter. Some people will argue that ice ages have waxed and waned for tens of millennia and that this is part of a natural cycle. That doesn't change the fact that black is coming up more frequently and you will get less out of an acre of corn than you used to. The price for that land simply cannot be justified by the income it can generate." In other words, it doesn't matter what's causing it, but something's definitely not right, and investing in protection from that uncertainty now seems a must..."
Global Climate Events In October. 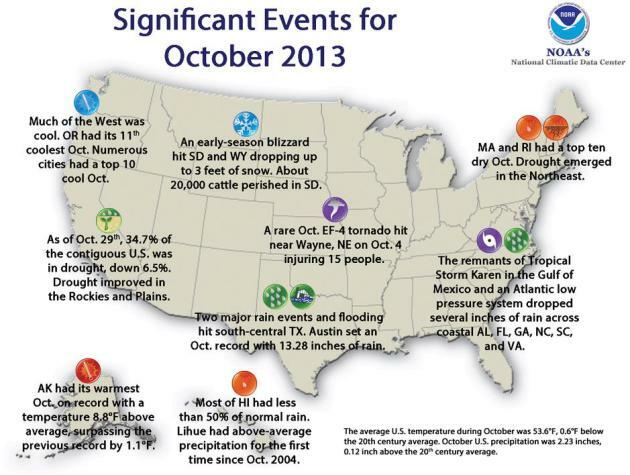 Data courtesy of NOAA NCDC. All Over The World, Hurricane Records Keep Breaking. A symptom of warmer seas or a statistical fluke? Chris Mooney takes a look at Mother Jones; here's an excerpt: "...But here's the thing: Haiyan isn't the globe's only record-breaking hurricane in recent years. Even as scientists continue to study and debate whether global warming is making hurricanes worse, hurricanes have continued to set new intensity records. Indeed, a Climate Desk analysis of official hurricane records finds that many of the globe's hurricane basins—including the Atlantic, the Northwest Pacific, the North Indian, the South Indian, and the South Pacific—have witnessed (or, in the case of Haiyan and the Northwest Pacific, arguably witnessed) some type of new hurricane intensity record since the year 2000. What's more, a few regions that aren't usually considered major hurricane basis have also seen mammoth storms of late..." (Image: NOAA). Haiyan, Sandy And Climate Change. 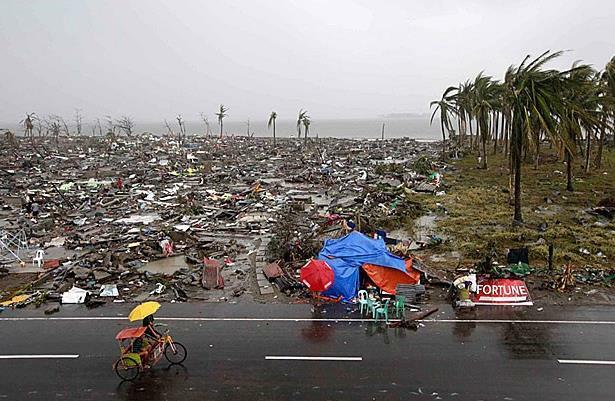 Jeff Nesbit has the story at U.S. News; here's the introduction: "Is climate change responsible for the devastation caused by Super Typhoon Haiyan – the strongest tropical cyclone to make landfall in recorded history? Was it responsible for Superstorm Sandy, which caused billions of dollars of damage to New York City and New Jersey? More broadly, is climate change starting to have an impact today on such extreme weather events? The answer to those questions is a complicated one, but it starts with the word "yes". Scientists have spent years researching climate change's role in specific, extreme events such as Haiyan and Sandy. But what climate scientists know today, with a high degree of certainty, is that all extreme weather events are now occurring in a world where the oceans are warmer, sea levels are higher and temperatures are rising. So the odds of more intense, devastating storms like Haiyan and Sandy are increasing every year..."
Photo credit above: "A resident bikes past the devastation in Tacloban, central Philippines." Gaps In Data On Arctic Temperatures Account For The "Pause" In Global Warming. Here's more information on the recent discovery, courtesy of The Independent: "...That much-vaunted “pause” in global warming can be largely explained by a failure to record an unprecedented rise in Arctic temperatures over the past 15 years, a study has found. Two independent scientists have found that global temperatures over the past decade have almost certainly risen two-and-half times faster than Met Office scientists had conservatively assumed when they estimated Arctic warming because of a lack of surface temperature records in the remote region. Moreover, when the latest estimates of Arctic temperatures are included in the global temperatures, the so-called “pause” in global warming all but disappears and temperatures over the past 15 or so years continue to increase as they have done since the 1980s, the scientists said..."
Surviving Climate Change: Is A Green Energy Revolution On The Global Agenda? Here's a clip from a story at Huffington Post that made me do a double-take. Will it really come to this? 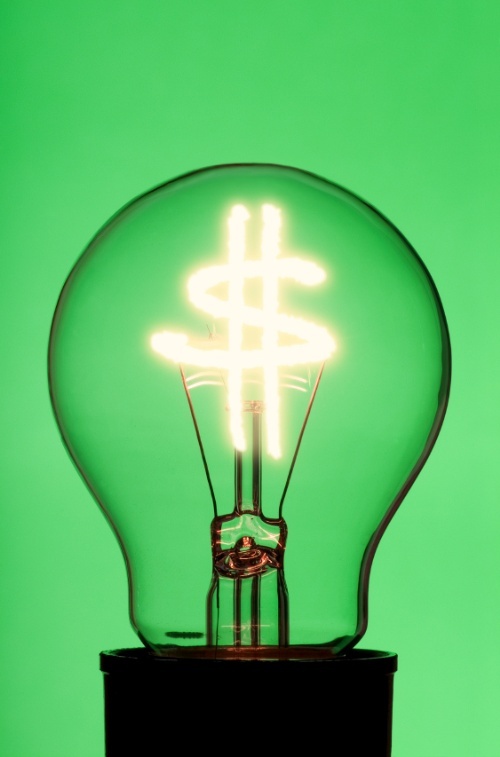 I hope we come to our senses long before there are protests on the streets, but some days I wonder: "...Nobody can say that a green energy revolution is a sure thing, but who can deny that energy-oriented environmental protests in the U.S. and elsewhere have the potential to expand into something far greater? Like China, the United States will experience genuine damage from climate change and its unwavering commitment to fossil fuels in the years ahead. Americans are not, for the most part, passive people. Expect them, like the Chinese, to respond to these perils with increased ire and a determination to alter government policy. So don’t be surprised if that green energy revolution erupts in your neighborhood as part of humanity’s response to the greatest danger we’ve ever faced. If governments won’t take the lead on an imperiled planet, someone will..."
Global Warming And Business Reporting - Can Business News Organizations Achieve Less Than Zero? 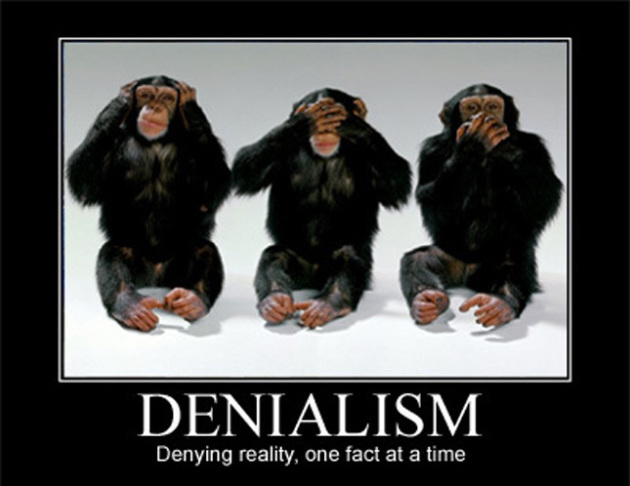 No, wait, there's a scientific disinformation campaign underway? Could it be because some (specific) businesses feel that their business models and future earnings are at risk? Here's an excerpt from The Guardian: "Some of the most popular business news outlets are complete failures when it comes to climate reporting. If they get basic climate science this wrong, how can they be trusted on any other topic? Recently, news outlets such as Forbes, the Wall Street Journal and CNBC have been in misinformation overdrive. It's not like it's difficult to get real scientists to speak to journalists. In spite of this, these news organizations have their so-called experts wax ineloquently on climate change, all the while displaying enormous ignorance of the actual science..."
Acid Oceans Could Cost The World Billions Of Dollars. The forecast calls for more jellyfish. Here's an excerpt from a story at Quartz: "Ocean scientists fear that climate change is dramatically shifting the chemical balance of the ocean in ways that will kill fish, molluscs and coral, harming 540 million people who depend on fisheries for their livelihoods—and anyone who likes a cheap oysters. Oceanographers gathered for a summit in Monterey, California, last month, producing a new report warning policymakers of the need to act. 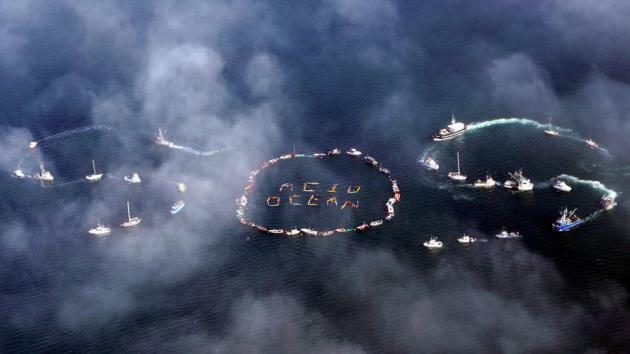 The world’s oceans are basically a giant carbon sink, absorbing about a quarter of carbon dioxide emissions. Since the industrial revolution, the ocean has become increasingly acidic due to increased carbon emissions—and at a faster pace than ever before—but that saturation is making the ocean less effective at taking carbon out of the air.."
Photo credit above: "Fishing communities aren't looking forward to a pH drop." Reuters/Lou Dematteis. Top U.N. Official Warns Of Coal Risks. Here's the introduction to a New York Times article: "Most of the world’s coal needs to stay in the ground if greenhouse gas emissions are to be held in check, the United Nations’ top climate change official said Monday in a speech to coal industry executives here in Poland, one of the most coal-dependent nations on Earth. 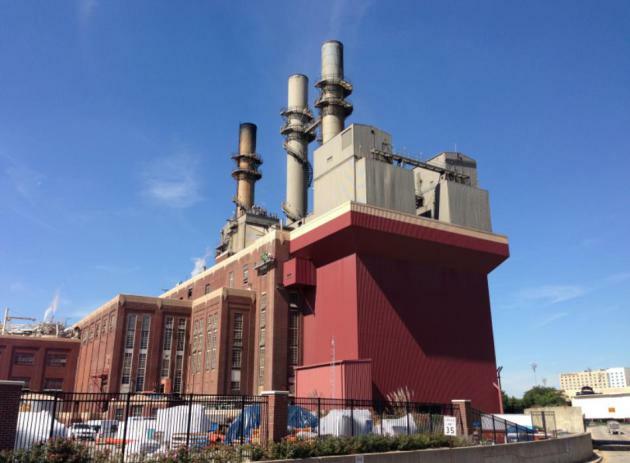 Christiana Figueres, executive secretary of the United National Framework Convention on Climate Change, told industry officials here that they were putting the global climate and their shareholders at risk by failing to support the search for alternative methods of producing energy..."